Last week I attended the ABQ Beeks meeting, thronging with new and returning beekeepers. We heard about the nasties—varroa mites and American Foulbrood— by a special speaker. At the end of the presentation, he referred to honeybees as “livestock. My hackles went up. The rise of industrial beekeeping, with the massive migration of hives around the country for pollination services, has contributed to the diseases and disservices we visit upon bees. Not only philosophically, how we think about them as “livestock”, but how we practice beekeeping. Most of their ailments are associated with crowding hives in the beeyard, trucking hives around the country, importation of new apis varieties that colonize native bees, bringing pestilence and disease and imposing chemicals that are harsh and toxic—a “thousand little cuts” according to Mark Winston, bee researcher/author. In a brief conversation with my bee student after the meeting, I wondered aloud if it was helpful to see honeybees as livestock. Does it diminish this wild creature and draw us away from exploring their nature as a super organism? My student chimed in…”And it’s an insect”, indicating how very different this species is from humans. And yet, how alike we are as well. Superorganism, human, insect, fowl, fourfooted, finned—we all need clean air, water, food. We all need community. 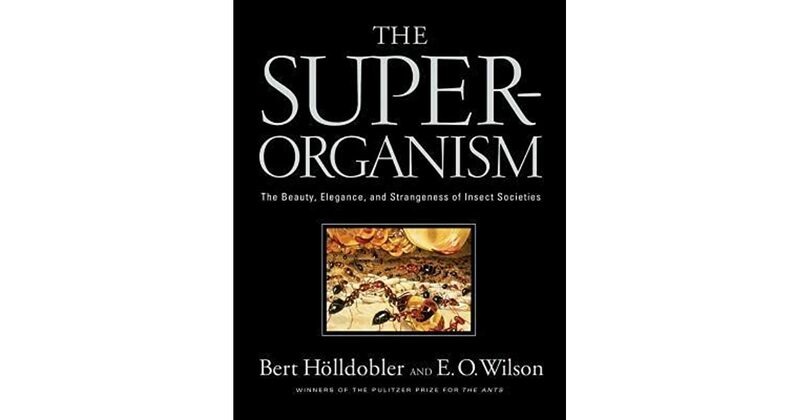 In The Super Organism: The Beauty, Elegance and Strangeness of Insect Societies, Burt Holldobler and E.O. Wilson, Pulitizer Prize winning ant researchers, laid out the “extraordinary lives of social insects…these superorganisms—a tightly knit colony of individuals, formed by altruistic cooperation, complex communication, and division of labor”. How can we even imagine how to properly take care of a bee unless we learn to “think like a bee” (which in itself might just be arrogant hubris)—-or at least try more and more to attune to it’s true nature and needs, rather than superimposing our human will on bees for convenience, profit, pleasure and ignorance. I was glad, in that moment, that my bee student had hung out long enough with me to understand what I hope to convey to future generations…a whole different lens by which to understand creaturely bee-ings of which we only play at stewarding and “keeping”. Truly, they have so much to teach us if we only would pay attention. listen. learn. At the end of our Bee Meeting, we had a panel of beekeepers talking about the variety of ways they address the disaster of varroa mites in their hives. It ranged from “soft” treatments of essential oils, formic and oxalic acid…to other non-chemical ways of treating bees such as splitting colonies, the “sugar roll”, rotating old, dark brood comb out, and brood breaks. I wondered if my approach of experimenting with essential oil was seen as “non scientific” and not-credible to some‚ though I cited varroa mite research from University of West Virginia and The University of Guelph, Ontario, Canada. I’ve learned that essential oils such as oregano, spearmint, wintergreen, tea tree, thymol, are full of anti-bacterial, anti-fungal, anti-pest compounds that can support bees in strengthening their collective immune system, while killing mites in the brood. Herbs being an integral part of bee’s landscape, we can we capitalize on what they already harvest, or is native to their food system? It is less expensive than chemicals and yes, it takes some experimenting. For me, to Think Like A Bee, is to ask, “what is the bees natural habitat?” and “What will be least toxic? How can I give them good health care without exposing them to harsh and intolerable living conditions?” It’s their home and their hive that I am exploiting in order to reap the rewards of their work. We humans have much to admire in the the superorganism world. Body wisdom at its best! If I use true as a verb then truing our words ideas practices and psyches to what the body wants is everything. To Respect and Dignify all! This is the holy quest. Have you seen wrinkle in time? The evil in it looks like the nasties you talk about. Wrinkle in time is on my short list! Thank you Cynthia. It is a holy quest. This resonates strongly with something that has been bubbling up in my awareness lately. We talk about us being the “Body of Christ” but it seems to me most of us (especially me) have no clear idea what that might mean. It has been coming to me lately that we are in the process of forming, or at least having the possibility of forming, some wonderful and mysterious mega or super-organism. As the scripture says, “what we will be has not yet been revealed but we will be like Him”. This journey of Faith becomes more glorious and wonderful and more mysterious with every passing day. It seems to me highly likely that the bees and ants may hold many lessons for us if we are only willing to be open to the teaching. All the fiction I have read that attempts to explore the ‘hive-mind’ phenomenon dwells on the horrors of losing all our humanity to whatever it may be. I think there may be another aspect that we are overlooking. I do know that one of the greatest hindrances to growth toward Christ is our overblown sense of our own selves. I also know that as I mature spiritually and as I, as part of that process, give up more and more of what I once thought of as my “Self”, in some mysterious way I do not pretend to understand I gain more and more of something that I do not want to call ‘myself’ but in which I feel more at home than I ever have before. Yes. Yes. Yes. Thank you for your thoughts Richard! Your post always nourish my soul…as I’m learning about bees, beekeeping, and the ongoing threats, my psyche and soul feel nourished, healed, inspired! I wonder if you may need to come to Seattle in the future to offer a retreat around your new book coming out and how it relates to care of creation??!!! WOULDN’T THAT be somethin’?! Sign me up for being your retreat convener/manager/corraller of body spirits. Whee! I the idea of cooperative super organism is fascinating! It may be one way that we are alike bees too…it seems like we are just beginning to understand the interdependence we have with the microorganisms inhabiting the insides and outsides of our bodies!